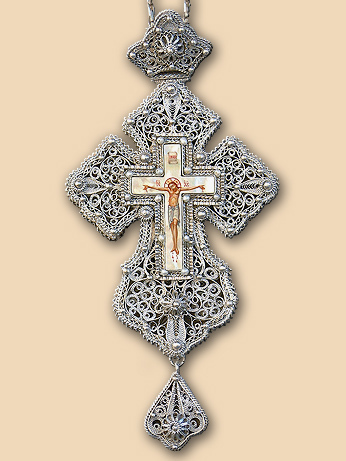 Pectoral cross in silver filigree with hand painted Crucifixion cross on Mother of Pearl. 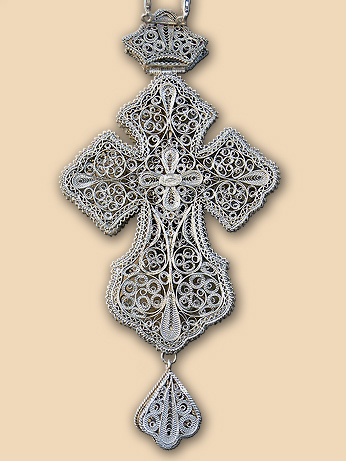 Size: cross 16,5 cm×8,2 cm. Weight: cross 130 grams, chain 88 grams. Commissioned by: Father Stevic Bogomir, Zvecan - Kosovo and Metohia. In possession of : His Grace Ephraim (Milutinovic), Bishop of Banjaluka.